Winners were announced at the Al Yasat Ballroom, Al Murooj Rotana Dubai, UAE at the end of 2016. Big Foot Systems was crowned a winner of the Dominic de Sousa Award for Innovation for its range of . Big Foot Systems has won an award for innovation at the Climate Control Middle East Awards 2016. 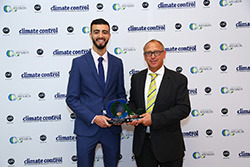 Now in its sixth year, the Climate Control Middle East Awards recognise and honour HVACR and allied organisations that show a strong commitment to socio-economic development and sustainable development goals in the region. Big Foot was successful at the awards since its type of non-penetrative system has not been used in the region before and marks a real step-change in rooftop plant support. For the Dubai construction market, Big Foot’s non-penetrative rooftop support systems tick all the right boxes since they are quick and easy to assemble and provide excellent support for HVAC plant and safe access systems whilst maintaining the integrity of modern roofs. Sam Birch, product manager at Big Foot Systems, said: “Winning an innovation award is a fantastic achievement and we are thrilled to gain recognition at these important awards for the region. Sister company, Aspen Pumps, was also shortlisted in the same category at the awards for its pumps’ ability to help recycle water. Since all the water in the region comes from the sea and is desalinated, recycling water is an important issue.